Participants praised their forerunners’ achievements at the ceremony commemorating 100th anniversary of the foundation for the Peru Okinawa Kenjin-Kai, on August 20, at the Kenjin-Kai Hall, Lima City, Peru. On August 20, the Peru Okinawa Kenjin-Kai held a ceremony marking the 100th anniversary of its foundation at the Okinawa Kenjin-Kai Hall, in Lima City, Peru, with approximately 250 people of Okinawan origin attending. 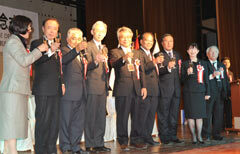 Participants at the ceremony praised the achievements of their forerunners, including the 30 people who set up the Okinawa Youth Fellow Association in 1911 as the predecessor to the Okinawa Kenjin-Kai, and vowed to come together again at the 5th Worldwide Uchinanchu Festivall in Okinawa in October. At the ceremony, on the Peruvian side, there was Victor Asato, chairman of the Peru Okinawa Kenjin-Kai; Mieko Moromizato chairwoman of the Women’s Association; Luis Uemura, chairman of Japanese Association of Peru, and on the Okinawan side, Deputy Governor Yoshiyuki Uehara; Yoshikazu Tamaki vice chairman of Okinawa Prefectural Assembly and Toshiyasu Shiroma chairman of Okinawa municipalities (Mayor of Haebaru Town). Deputy Governor Uehara read a message from Governor Hirokazu Nakaima stating, “Underpinned by their love for their homeland, our predecessors played an active role in all aspects of Peruvian society, including politics, economy, education. We want you to be even more active to help gain momentum as we move forward from the 100th anniversary of the establishment of the Kenjin-Kai.” He presented certificates of appreciation to past chairpersons of the Kenjin-Kai and the Women’s Association.